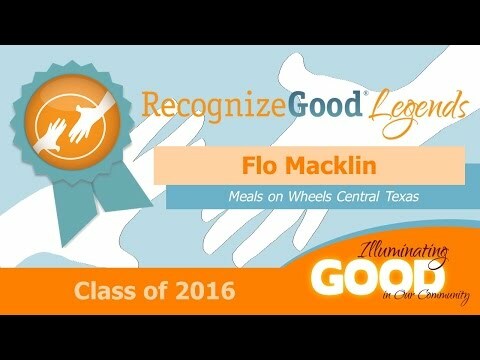 Before health concerns finally forced her to make the tough decision to “retire” as a Meals on Wheels Central Texas volunteer, Flo Macklin had been delivering meals through the local nonprofit for as long as they’d been around. One of the original volunteers for the agency when it first opened its doors in 1972, Flo spent the next 42 years putting compassion into action every week as she delivered hot, nutritious meals and a friendly smile to the doorsteps of the homebound, older adults served by the organization. Over that time, Flo served over 2,700 volunteer hours and delivered over 17,000 meals. As the organization grew, eventually cooking duties were taken over by people who did it for a living. Today, Meals on Wheels Central Texas (MOWCT) is one of the largest meal-delivery organizations in Central Texas, serving more than 3,000 meals each business day and more than 800,000 meals to over 5,400 clients in Central Texas each year. Most MOWCT clients are homebound adults, and the organization’s holistic approach also includes services like home repair, grocery shopping assistance, Alzheimer’s respite and pet health care for its clients. Flo continued to deliver meals to South Austin clients every Wednesday, but considers herself lucky to not be tasked with cooking the 3,500 meals prepared by the organization every day.